I was introduced to Wade Davis through the University of British Columbia. I was a student in the first introduction to anthropology class he would teach at UBC, and his lectures were unlike anything I experienced in academia. I remember one class we were learning about the complexity and intelligence of the Polynesian Wayfinders, a culture that perfected navigation well before European contact. Sitting in front of me were two twenty year-olds. The first couple of classes they were the backwards baseball cap wearing students who would rather talk about their weekend plans than listen. And in fact that’s how the class started, but midway through the lecture they stopped talking and for the rest of the term they listened. Those students never stood a chance. Wade Davis has lectured at the American Museum of Natural History, the Royal Ontario Museum, given numerous Ted Talks, and delivered the CBC Massey lectures. He’s also the author of twenty books. Into the Silence: The Great War, Mallory and the Conquest of Everest received the 2012 Samuel Johnson prize, the top award for literary nonfiction in the English language. 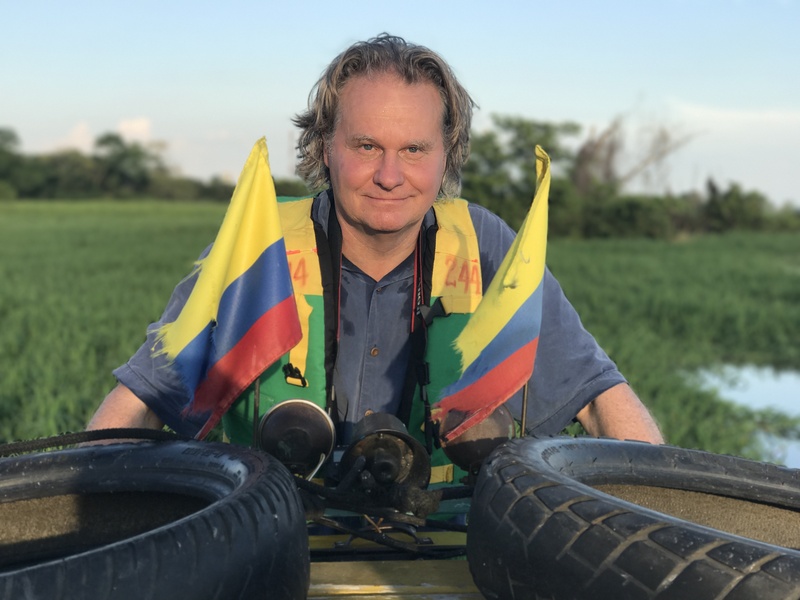 Not only can Wade Davis speak in a non-academic fashion, but between 1999 and 2013 he served as Explorer-in-Residence at the National Geographic Society and is the BC Leadership Chair in Cultures and Ecosystems at Risk at UBC. In 2016 he was made a Member of the Order of Canada. I sent Wade an email thanking him for his class and asking him for an interview. A couple days later he responded and happily agreed to speak with me about literary non-fiction, anthropology, and even Donald Trump. How do you select a project? Do you go looking for a story or do the stories find you? I think Hemingway said the most important credential for a writer to have is something to say that the world needs to hear. He also said famously that anyone who thinks that writing is easy is either a bad writer or a liar. In other words, book projects are always all-consuming and I’ve always found that the thing that gets me through a project is passion, and I mean that in the sense that I really have to care and feel to some extent that I’ve got some mission. This is not something that I think about consciously; it just seems to be the way that it works. If you look at all the books that I’ve written they’re always driven by a sense of mission, so for example when I came upon voodoo having no previous experience with the African world view I became in a sense outraged at how this religion had been reduced to caricature. There’s no question that that was a motivation that kept me pursuing that subject. At one level it was a scientific investigation but it was also driven by an almost evangelical sense of addressing that wrong and revealing to the world that voodoo was by definition the religion of Africa. That’s why it was so appropriate that the subject that I was studying, zombies, was a phenomenon that had been used in explicitly racist ways to denigrate what is in fact a remarkable religious world view. Similarly when I wrote the book One River, I was really motivated by a desire to position Schultes in the historical light that he deserved, and Tim Plowman. In fact that book was literally conceived as I stood at the podium at the Field Museum in Chicago delivering a eulogy at Tim’s funeral service. Other books, such as The Wayfinders, were driven by my concern as an anthropologist and trying to draw the world’s attention to the central revelation of anthropology, the idea that every culture has something to say and each deserves to be heard. So all of my books have been driven by some kind of sense of personal mission if you will. You just never know where that idea is going to come. I mean, the most important book I’ve ever written, and by far the best, is Into the Silence, and that was almost conceived on a whim on the eastern flanks of Everest when I stood on ground higher than anything in North America and looked up at two vertical miles of ice rising on the face of the South Col. And my friend who had brought me to the valley, Dan Taylor, suddenly began to speak of these Englishmen dressed in tweeds who read Shakespeare to each other in the snow at twenty-two thousand feet. And I was always intrigued by the great war and knew a lot about it. Books like Into the Silence, One River, and The Wayfinders blend historical and anthropological research with beautifully written narrative. How do you balance the need for academic rigor while writing for a commercial audience? What is your philosophy on how to create a product that speaks to both academics and a general audience? There’s a reason that most academic books go unread, and that’s because they’re largely unreadable. What does it mean, academic rigor? It means well researched. One thing that I certainly learned through my academic training is that you learn to distinguish research from Xeroxing. Most people have no idea what real research is. For Into the Silence, I purchased and read over six hundred books. Myself or my research colleague went to fifty-seven archives for that book. I research to a fault and I’ve spent as long as ten days of research to produce one single sentence in a book, and I think that’s what makes literary non-fiction work. There’s an element of creating an aura of authenticity. For a book like One River where I inserted dialogue into the text, obviously that was a fictional device. I certainly don’t know what Schultes said to somebody in 1940 anymore than I can actually remember what I said to Tim Plowman myself in the 1970s, but you can’t do that in a casual way. If you’re describing a meeting for example you have to know that the meeting took place, what the agenda was, who the players were, what the outcomes were, even what the light was in the room that day in Bogota. I was always wondering how Schultes, the archetypal academic, would view that device in his own biography. And at one point he took me aside and he pointed to some dialogue I had made up and he said, “You won’t believe, Wade, what Mrs. Bedard said to me in 1943 when I met her. Look, it’s right here in this book.” That fictional use of dialogue so resonated with authenticity that it became his reality. Now that’s an extreme use of the literary devices in a work of non-fiction but in general you have to make sure that everything you are saying resonates with authenticity. Barbara Tuchman, the great historian who wrote The Guns of August and The Proud Tower, had a note above her typewriter that simply said, “Will they turn the page?” The great joy and challenge of literary non-fiction is to create a narrative that is factually as accurate as anyone can conceive, but the very act of selecting what you’re going to put into a book is in a sense a fictional device. For example in The Serpent and the Rainbow, it’s absolutely non-fiction in the sense that every event in that book happened and happened to me and I’m recalling it to the best of my ability. On the other hand is it an accurate account of my experience in Haiti? I don’t describe all the moments when nothing happened or when I was sick, so obviously you’re picking the elements that allow you to weave a narrative and that narrative is being forged by the recollection of how you saw an event. In other words if I describe somebody entering a trance during a ritual in Haiti I’m accepting the legitimacy of that spiritual aspiration, but if I was a fundamentalist Christian missionary who viewed spirit possession as a sign of the devil obviously the way I would account or describe that would be very different. In a work like Into the Silence, there’s a much more subtle challenge. If you want to understand who these men were by the time they got to Everest, how could you possibly ignore the fact that at least twenty of the twenty-six of them had spent four years and four months deep in hell on the Western Front? This was a seminal experience in their lives so I set out to find out where each of those men were every single day of the Great War. I then was able to, using sometimes their own sources but often other sources, ascertain to the best of my ability what they might have been exposed to. So if George Mallory was on a retreat on a dark night in August of 1916 he may not have written to his wife everything he saw that night but if I could locate a memoir from his commanding officer who trudged down that same road with him that night and said that artillery shells fell before us and blew half of us to smithereens, I could with great confidence report that that event had happened and that Mallory was there. But that takes on an enormous amount of research, which is why Into the Silence took twelve years. Nothing irritates serious writers more than when academics question their legitimacy simply because they manage to write in a style that is intriguing and attractive to the general public. If you take two of my books about the same subject, Passage of Darkness and then The Serpent and the Rainbow, it’s essentially the same book, but one was written to satisfy my Ph.D. committee at Harvard and it’s written in the vernacular of academic prose with the appropriate footnotes, etc. But in fact that academic style is a gloss that creates a pretense of objectivity that didn’t exist, and if you read The Serpent and the Rainbow, you actually are in a much better position to critique my work because you can see how the data was collected. So ironically The Serpent and the Rainbow is a more honest depiction of my experience in Haiti. The idea that academic writing necessarily implies an objectivity and therefore is somehow more valuable and more accurate than literary non-fiction is nonsensical. A lot of early career writers want to write diverse stories, but they don’t want to appropriate culture or write anything offensive. As someone who has written successful literature about cultures other than your own, and have become family to people all around the world, what are your thoughts on writing cultural difference? What advice can you give to writers who want to write diversity but might not know how to? I may be seen as old fashioned, but I just ignore the whole question of appropriation. I believe that everybody who is a human being has a right to tell stories but obviously I’m highly respectful, highly deferential, highly sensitive to the concerns of the people of whom I write. For example, a lot of travel writers from Ed Hoagland to Paul Theroux propel their prose by reducing people to caricatures. You can read a work of travel literature and find it very amusing because the author goes from one person to the next, poking fun of their foibles, but if you’re actually that person being poked at, it’s not so nice. That to me is real appropriation: reducing the people you meet to caricatures that fit your agenda in order to entertain your audience. In everything I write I elevate people. I present the better aspects of their nature. Everybody I write about comes out looking grander than they may feel about themselves. That’s how I view the world. I think issues of cultural appropriation paralyze the academic world. I was doing a talk at UBC years ago and telling some stories that an old Gitxsan elder had shared with me over many years, and I had lunch afterwards with someone who I guess was a failed academic and had found herself in administration and appointed herself as what I dismiss as the intellectual Thought Police. She said to me, “Have you filled out your xxyp-form on human engagement,” or some bureaucratic thing. And I said, innocently enough “I don’t even know what that form is.” And she said, “Well, by what right did you share with us this man’s stories?” This is the kind of thing you hear all the time now, and I just couldn’t believe my ears. In a very politically incorrect way, I said the obvious: that the reason I’m telling these stories is because he shared them with me. Have I earned the right to share these stories? I don’t know, but I think I have. I cut so many cords of wood with him for so many years, bought him hearing aids for no motivation other than to help him out, and fixed his plumbing twenty-five times—now I’m joking, but my right to those stories is based on the legitimate and authentic relationship I had with him. Not because I got him to sign some release form concocted by some lawyer at some university two thousand miles to the south. I’m profoundly, in a sense, libertarian in my thinking about that. Since I was fourteen I found myself living as a guest in cultures other than my own. I’ve always been extraordinarily respectful, which is evident in my writing, and I earn the right to tell stories based on the human interaction that I create with people. I mean, I understand that if you want to embark on an ethnographic research project for many years with the Haida people of Masset in, Haida Gwaii, there are proper protocols. Of course you’d want to go to the band council and seek permission, you want to go to the elders and seek permission. I do that reflexively. I just don’t need a government form to tell me how to do it. Of course I do understand why those forms have been institutionalized: because in the past people didn’t show that deference or respect. But my feeling is that had I not been deferential and respectful I never would have been able to do what I’ve done all of my career. And I think my body of work speaks for itself in that regard, and my reputation frankly. The problem with these release forms, as anyone who’s actually done the real work in the field knows, there’s nothing more awkward than to present a release form to someone as your very first gesture. A release form which is all about a meaning which they may or may not even understand. I understand that you are an admirer of Ruth Benedict, Davis Maybury Lewis, and Margaret Mead who emphasized anthropology as activism. Your writing often if not always makes a case for cultural diversity and the importance of ethnological conservation. How can writers and other storytellers continue to be political and write in a way that brings positive change to their communities? Ruth Benedict said it well: the entire purpose of anthropology is to make the world safe for diversity. Never has that mission been more important than today. I deliberately requested to teach intro to anthropology when I joined the faculty at UBC because I wanted to speak not just to anthro students, I wanted to speak to young students from across the university. I have three hundred students in that intro class every fall and I noticed something very remarkable this fall. First of all, in that class I’d say sixty to eighty percent of the students are from abroad or people of colour from all over the world and it’s wonderful, but you cannot believe how many came to me in office hours and said that your class makes me feel safe to be in Canada right now or to be in North America. And that’s really the miasma of Trump and how its struck fear into the hearts of people of colour from around the world. Anthropology ought to be the vocal antidote to Trump. Anthropology has so much to say to the world, and yet anthropologists have generally been rather mute. The whole purpose of anthropology is to put the dagger in the heart of racism. To show that the other peoples of the world aren’t failed attempts at being you, that every culture is a unique answer to the fundamental question: what does it mean to be human and alive? When other peoples of the world answer that question they do so in the seven thousand voices of humanity. This is the entire purpose, in a sense the mission of anthropology. And anthropology has always had an activist element to it. Going right back to the father of cultural anthropology in North America, Franz Boas. Ruth Benedict was his student, and that line of hers is echoing a similar line that he famously said. So in anthropology, particularity in the Americas, there’s always been that activist tradition where the anthropologist becomes not just the intermediary but an advocate of indigenous culture where he or she is living as a guest, but also an activist joined together in pure collaboration in a global struggle for cultural survival. I think this is an essential role that anthropology has played and that’s why I’m such an incredible defender and advocate of classical ethnographic anthropology. What generations of anthropologists have done for the world is extraordinary, but the problem is that within the academic context there remains an inhibition at sharing the lessons of anthropology publicly. At a place like UBC, eighty percent of Ph.Ds at UBC do not stay within the academic world, and yet we still have the pedagogy that treats all graduate students as if their destiny is to become a professor somewhere, and it’s just not going to happen. One of my issues is what are we doing for the eighty percent and are we really delivering them the skill sets that will allow them to monetize their considerable knowledge for their own benefit and to the benefit of the profession and to the benefit of the society? And the answer is we’re really not. I’ve been astonished that advanced graduate students at UBC, in my experience, have never once been trained in public speaking. I’ve been astonished by the inability of some graduate students at UBC to form proper English sentences. The lack of writing ability in graduate students that I’ve encountered at UBC has been shocking to me and these are bright, hardworking, ambitious, diligent, and wonderful students. They’ve just never been exposed to proper editing, and dreadful writing is accepted as a matter of course. Which is why ninety percent of academic articles are never cited—because they’re never read. How does storytelling change from writing, to speaking, to lecturing a class? Are there similarities between the mediums? To me it’s all one in the same. I think of myself truly as a storyteller, and I tell stories across multiple media: films, photography, public speaking, and writing. Another reason we should be teaching students these skills is it’s a fantastic way to generate revenue. The reason I’ve never had to take any writing assignment I didn’t want was because I could always augment my salary with speaker’s fees, and in fact public speaking has been my main source of revenue for twenty-five years which is exactly why I’m able to devote, if I want to, twelve years to a book project. It’s also why I don’t waste any time writing grant proposals because grant proposals are enormously difficult and time consuming to pull together with no guarantee of receiving the grant. I never mistake activity for results and writing a doomed grant proposal is the epitome of mistaking activity for results. I began my speaking career when I would write a book and I’d write a speech to promote that book, which was what most writers did. And at one point my lecture agents said, “Well, couldn’t you come up with a lecture that was sort of your greatest hits?” So I pulled together some themes and before I knew it that lecture was successful and became a book, Light at the Edge of the World, and then that book became my mission statement for what later became a fifteen year run as an Explorer-in-Residence for National Geographic. So I don’t really draw a separation between books, speeches, films. They’re all forms of story telling. What matters is the power and the resonance of the actual story. How important is story to culture? It’s essential because it embodies the past and it anticipates the future. A narrative creates a code of how a people are expected to live. Stories are all about metaphor, and they all encapsulate values that inform all of us of what it means to be human and alive.